Do I Need to Rent a Car When I Visit New Orleans? First-time travelers to New Orleans, when planning their vacations, often wonder if they'll need to rent a car if they're staying in the city. So what's the verdict? In a word, no. Most visitors to New Orleans not only have no need for a car but are actually better off without one. Parking in the French Quarter and Central Business District -- where the majority of the city's hotel rooms are found -- is scarce, annoying, and expensive. Expect to pay anywhere from $15-$40 a day, depending on whether you're using a self-park lot or a valet. So How Do I Get Around? For starters, you can walk almost anywhere in the main tourist hubs of the city. New Orleans is well-sidewalked (though watch your step; they're not always in the best repair on some side streets) and is, in fact, one of the greatest walking cities anywhere. The French Quarter, for starters, is full of sights, sounds, and smells you'd never notice from a car, plus it's really not very big (it's about half a square mile total -- 13 blocks in one direction and 7-9 in the other). Walks through the Garden District or down Frenchmen Street give you the quintessential feel of New Orleans, and it'd be a shame to think you could get the same feeling from inside a car. 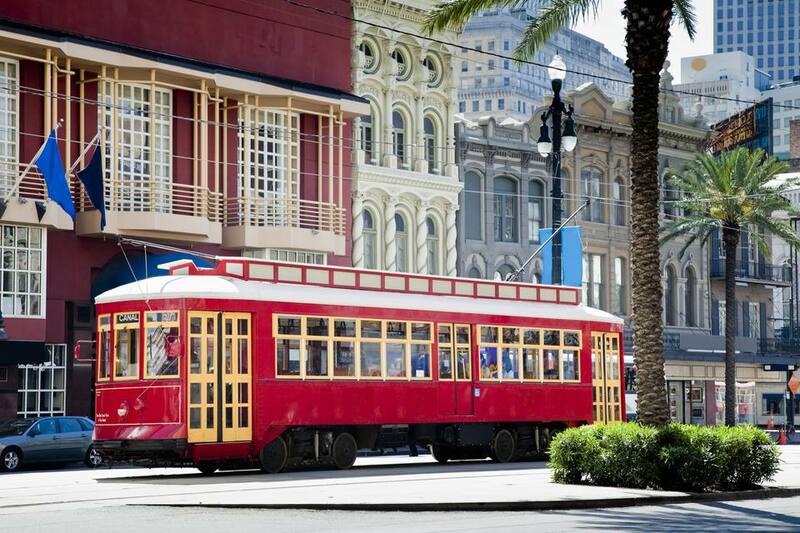 In order to get from the French Quarter or CBD to the Garden District, City Park, the Cemeteries, or the Universities, you can take one of the famous New Orleans streetcars. They're cheap, easy, convenient, and fun. Another fun way to tool around town is to rent a bicycle. New Orleans is an easy city to ride a bike in, even if you're only an intermediate-level rider. It's flat as a pancake, for starters, and less than an hour from end-to-end on a bike. It's also a town where biking is pretty common, so there are bike lanes on some larger thoroughfares and a general awareness of cyclists in most neighborhoods (though watch yourself in the CBD, which tends to have more car traffic than other areas, and be careful to stick to safer neighborhoods in general). There are a number of good bicycle rental companies around town. In the French Quarter, try The American Bicycle Rental Company or rideTHISbike. In the Marigny, try Bicycle Michael's. In the Garden District, try A Musing Bikes. And if all else fails, you can always take a taxi. You can sometimes flag a cab in the French Quarter, but you're probably better off just calling one. United Cabs is the biggest company in town, and generally the most popular. Nawlins Cab is another good option. They offer an iPhone app from which you can "call" a cab, plus their fleet is made up primarily of Prius hybrids, which is kind of fun. Taxis aren't super-cheap, but they won't break the bank, either (a fare from any given CBD hotel to any given Uptown or Mid-City music club, for example, would more than likely be under $20). They're certainly much cheaper than a rental car and parking. The moral of the story? Don't waste your money or time on a rental car unless your travel plans really require it. Most likely, they won't.